Uma Ghosh is a Dubai-based award-winning TV Producer, Entrepreneur, Certified Health and Wellness Coach and an Influencer who has been in the TV industry for the last 13 years. She is credited for pioneering the television broadcast industry in the Middle East for South Asian diaspora. She started her journey in 2005 and founded ‘Queen Bee Production’, a top of the line production unit, with a vision to provide high-quality programming in the region and beyond. Under this banner, she launched 8 successful shows across various channels in the Middle East beam which include High Life Dubai, Top Guns, love4food, ZEE Connect, TOTT, PropertyScape and her pet project The UMA Show to name a few. The UMA show embodies her belief that everyone has aspirations and dreams of living well and healthy, and anyone who dreams it, can definitely achieve it. Over the years,through her shows, Uma has raised awareness for many causes and interviewed many successful personalities right from celebrities, artists, successful entrepreneurs, visionaries to political figures. Uma’s experience, her journey on TV and her interaction with a multitude of people from various fields, nationalities and cultures contributed to her own personal growth as an individual and made her realize that Health, Fitness and Wellness were her true passion and calling. This led her to pursue an education in this field and become a certified Holistic Health & Wellness Coach. It saddened her to see that everyone today is just running a blinkered rat race to achieve their goals. Thus, by using her medium and knowledge as a Health & Wellness Coach, she began working towards creating awareness and empowering people on how to achieve an enhanced quality of life, achieve personal growth, and reach your potential through positive lifestyle behaviour and attitude. She believes that the pursuit of health, personal growth, and improved quality of life relies on living a balanced life, and to achieve this balance, we need to care for our mind, body, and spirit. As a Holistic Health & Wellness Coach, she encourages people to be gentle with themselves as they explore ways to make changes in their lives that work for them and fit their needs, interests, and desires. Uma successfully ventured into the digital space through her lifestyle and wellness channel on theumashow.com in 2017 that got her many more followers upon its inception, and the numbers are continually growing on this platform. Uma says – Over the years, I have put in an insane amount of hard work and long hours to gain this knowledge that I am still learning, and today I am committed to share the very best of my learnings in an honest and real way. Success and may it shower in abundance, should never come at the cost of our well-being. I believe that no matter where you are in your life, there is always a better option, to lead your best life ever. Now, as a wellness entrepreneur, content creator and Certified Holistic Health and Wellness Coach, her mission is to make people healthier and happier while being more efficient and productive, simply by rejecting burn out and prioritising well-being. 2017 – Recognized as a wellness and health influencer by Dubai Health Authorities. 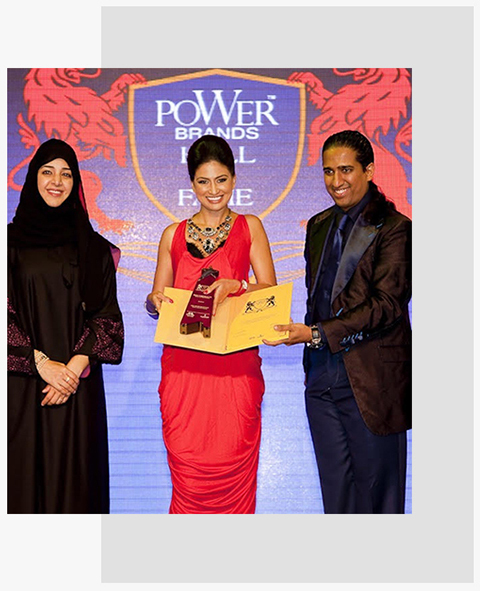 2011 – Was on The 40 Most Influential Asian in UAE list. 2010 – Masala Award for best TV Presenter.